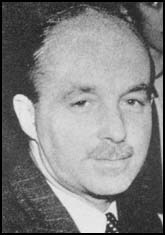 Another blogger, and intelligence researcher, Tony Percy has recently tackled the issue of MI5's B-Division structure during the 1939-1941 period. B Division, under Guy M. Liddell, underwent a significant restructuring in mid 1941 and most authors reference the sections of B Division using the post-restructuring nomenclature. T.A. Robertson's section, for example, is generally referred to as B1A, it's post mid-1941 restructuring title. The problem is that most authors will use that same title for Robertson's section BEFORE mid-1941, when it was actually called B2A. There is a pre mid-1941 structural nomenclature and a post mid-1941 structural nomenclature, and they two are very different. Tony Percy has posted a well-written blog about this issue, and readers are encouraged to visit his blog to get a more in-depth look at the issue. Tony calls into question the organizational chart of Curry and asks some pointed questions about "authorized" or "official" MI5 histories which neglect to assist readers in navigating the shifting tides of B Division's nomenclature. Thanks so much for the mention, Giselle. We are of a single mind, wanting to clear up a lot of the confusion that resides in the archives - and the official histories!